Jazz musician John Birks “Dizzy” Gillespie was born in Cheraw in 1917. Story has it that as a child, Gillespie often would sneak into the Town Green’s movie house, the Lyric Theater. The owner eventually caught Gillespie and then employed him to catch similar-minded youth. The Lyric is now a live theater known simply as the Theatre on the Green. Gillespie left Cheraw at age 17 to pursue his musical education at the Laurinburg Institute in North Carolina. 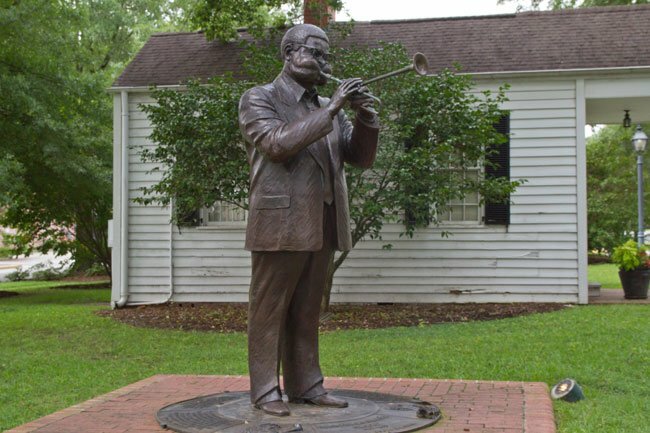 His Cheraw roots remained deep, however, as he opened most sets by introducing himself to the audience as “Dizzy Gillespie from Cheraw, South Carolina.” To commemorate the trumpeter and his famous bent horn, the town commissioned sculptor Ed Dwight to create a seven-foot bronze statue of Gillespie, which was added to the Green in 2002 to mark the 85th anniversary of his birth. 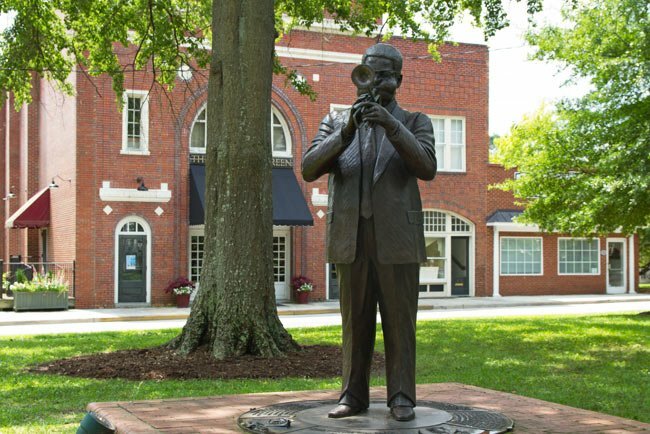 Cheraw is also home to the South Carolina Jazz Festival in honor of Gillespie, held the third week of October each year. 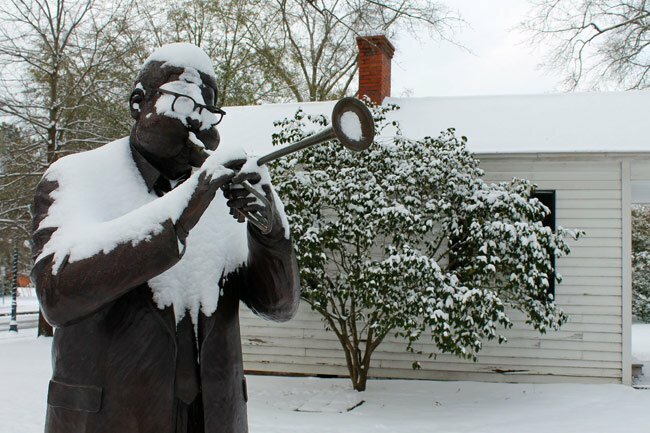 The photo below, captured by Cheraw’s Director of Tourism and Community Development, David Sides, shows Dizzy trumpeting his horn in the January 2014 snowfall. Besides Ancestry is there some place in Cheraw where I Can Find my family there? Hello, your best bet would be by trying something out like Ancestey or GeneaolgyBank. You can possibly find these resources for free as well depending on the site but we would recommend by starting to search for census records which would indicate years in Cheraw. Hope this helps! My great grandfather listed on his Texas marriage certificate, dated 1885, that he was from Cheraw, South Carolina. Can I find out when he lived in Cheraw and where he came from? His name was David Coit Malloy, the same as mine. Thank you. CHERAW, South Carolina, family home of the Baltimore McLeods! Great pics, and so nice of Jim to share with us!